It’s mid-Autumn in Melbourne: it’s dull, it’s cold, it’s wet. What better weather for throwing a rug over your knees or wrapping one around you whilst you settle in to watch your favourite TV show, or read a great novel. Don’t have a throw yet? Here’s the fun part: it keeps you warm as it grows on your needles or hook! This week we look at two throws that can be made in portable pieces, and are then joined together. Another bonus it that they can be a great use of scraps, oddments and left overs. 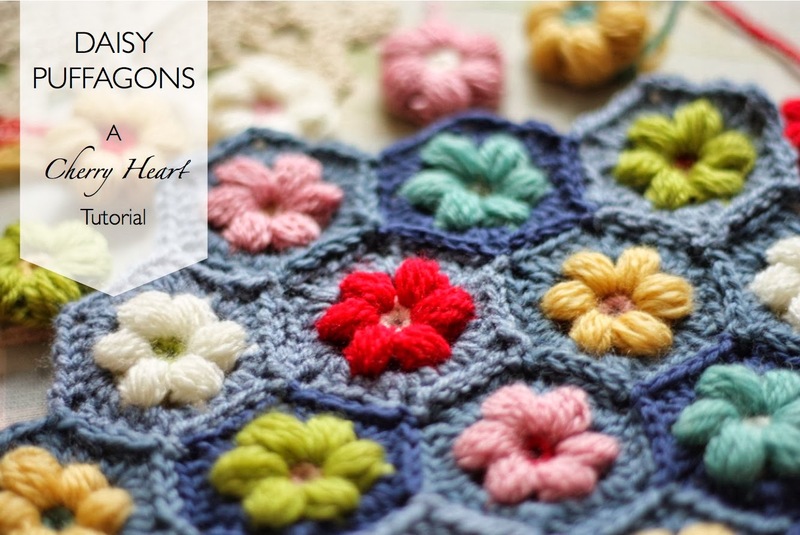 The Daisy Puffagons crochet pattern by Sandra is both a written pattern and picture tutorial to make these cute little hexagons. What you create with the puffagons is limited only by your imagination. Make a WIP bag, cute cushion cover, or go for the full Blooming Garden! Any yarn can be used, and whilst the pattern is written in UK/Australian terms there is a conversion table given at the start of the pattern. Make one or many puffagons today! The Arabesque Throw from the Berroco Design Team is a knitting pattern that creates modular hexagons. Worsted weight yarn and 4.00-4.50mm needles are called for, although you could use any weight yarn and appropriate needles. The hexagons can be knitted up individually and sewn together, or you may join the hexagons as you go by picking up stitches on one hexagon edge to create the next hexagon. A simple chart is used to knit the hexagons, and the pattern shows the layout for a co-ordinated look; but you are free to go for a scrappy look too.